This is a delectable dessert recipe by Tupperware. It is great with every day meals or with a special holiday dinner and the best part is that it only requires 3 ingredients. The recipe calls for pear halves but I have also made it using peach halves and it was just as delicious! Place chocolate in 2-cup/500mL Micro Pitcher. Using a the defrost setting, heat chocolate in microwave for 1 minute until melted; stir with Saucy Silicone Spatula until smooth. If chocolate is not completely melted, microwave at 15 second intervals and stir until smooth. Set aside. 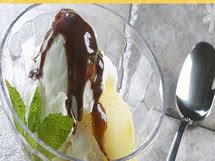 To assemble dessert, using the Ice Cream Scoop, place a scoop of vanilla ice cream in the bottom of the Ice Prisms™ Small Bowl; cover with a pear half and add another scoop of ice cream. Pour melted chocolate over the top. Garnish with strawberries and whipped cream if desired. Super easy to make, sounds absolutely divine.